70+ auctions won and still saving! Looking back, I remember the first day I played DealDash. It was June 28th 2013. I was at home that afternoon. I’m a teacher, but I hold a summer job each year. Kind of have to. Supporting a family of four off of a single income from a teachers pay is no easy task. I’m not complaining though…we make it. My summer job is evening shift, Sunday through Thursday. But, this was a Friday. I had the day off. I just finished mowing the lawn and came into the house. The TV was on with a commercial…about DealDash. I had never heard of Deal Dash before. It was certainly intriguing, the commercial had a great number of personal stories about how customers purchased amazing products at unbelievable prices. I was skeptical, but intrigued, so I visited the website. When I learned that you had to pay in advance for bids, I almost exited the website. But, those personal success stories from the commercial echoed in my mind. Money was tight, but what the heck…I bought one bid pack. Not sure what I was doing, I first targeted a $15 Amazon Gift Card. I bid twice…AND WON!!! An energy and excitement ran through me. This DealDash thing is real! Part of me new this may be beginners luck, but I tried again. I spotted a baseball in a case. $32 retail value. This would be real cool for my son. I placed two bids on it…AND WON AGAIN!!! You can probably imagine the adrenaline I felt. I never win, but to win these items felt so rewarding. Especially when you are bogged down by the stress of finances so much. I got nervous and hesitated though. This was beginners luck, didn’t want to waste my bids. Maybe I should watch for a while. The next few minutes blew my mind. A $10 Duncan Donuts card sold for a penny. A $10 Burger King card received no bids at all. A $10 Walmart Card sold for 3 cents. Wow!!! I bid again. This time on a pair of binoculars. Another cool item for my son. I WON…WITH ONE PENNY! I bid again, on a 3 piece grilling set and easily WON AGAIN!!! Feelings of excitement and thrill pumped through my veins. This Deal Dash thing was the answer. It was the answer to providing my family with things I just couldn’t give them. I went wild. I bid on all kinds of things. But I didn’t win again…at least not with that first bid pack. So I bought another bid pack. But I didn’t win. I couldn’t shake it off though. I knew I could recreate what I had started. The problem was, with each bid pack I purchased I was losing money. I wanted to win so bad. To get things affordably for my kids, and to gain back the money I had lost trying to repeat these early wins. I bought more and more bids packs. Over the next several days I began to slow down, but damage had been done to my budget. Fortunately, I had my summer job. Although I slowed down on buying bid packs, I could not quite shake off those early wins. Those FOUR wins could not have been a fluke. There must be something I am missing. Over the next few weeks I slept less, did less around the house. Turned to the computer every break at work. I watched Deal Dash..,always watching Deal Dash. Those early 4 wins had left a feeling in me. A feeling I couldn’t shake off. I needed to recreate the feeling. Next paycheck, I bought more bids. I tried different strategies and times of day. I knew there was something I was missing…I had to find what conditions led to my early wins…maybe it was time of day. Or time of month. Or something. It took me a while to realize I would never recreate that same set of wins. I didn’t truly give it up until I recruited family to join DealDash. That’s when I realized what happened. When a new user first signs up he/she has some auctions meant only for new the users. They are the lower valued items like a $10 Walmart card, $10 Burger King card, $10 Duncan Donuts card, etc. It’s designed so that a new users only compete with each other making the auctions easier to win. I admit, I felt scammed. I didn’t know those items were only part of special auctions for new users. I betrayed my family when I became blinded by cheap wins and spent a great deal of important funds. At least it was a lot to us. Even more, I had betrayed time to my family as I tried to figure out what I was doing wrong and studying how to recreate the conditions that gave me those early wins. I’m still with Deal Dash though. I’ve moved past those early losses and time spent studying Deal Dash…wondering why I couldn’t recreate those first wins. 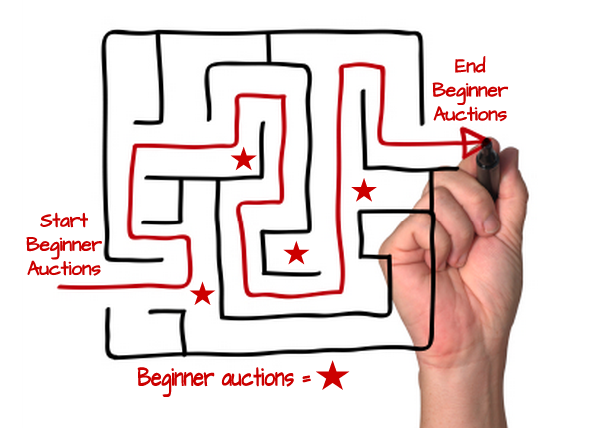 Now I know how to bid, I know how to play it right, and I now know how to save on Deal Dash winning and saving on over 70 auctions. Am I still bitter that not knowing this led to me spending important money and invaluable time focusing on Deal Dash? Absolutely – if only I knew those were beginner auctions…it would have changed a lot for me last summer. Would I, and do I recommend Deal Dash? Absolutely. But, if you are a rookie, heed my warning. If you win a string of low value items early, like I did, you need to know, those easy wins may have come from auctions with only rookies which often only have 2 or 3 people in them…if anybody. Deal Dash is great. But learn from my mistake. DO NOT let yourself get caught up emotionally in those first wins…the feeling is addictive. Fight it, and play intelligently. This entry was posted in Bidding Tips, Home and tagged Auctions, beginner auctions, Deal Dash, DealDash, Free DealDash Bids on March 18, 2014 by . good post, it would be nice toget easy wins back.